There is something about interior design that has always enticed me! I use to spend more time building and decorating houses on the Sims then actually playing the game. I guess some things never change considering I am just as interested in outfitting a room as I am myself! I think that the space you get yourself ready in should be just as unique as your personality and I can't help but adore all the trinkets and accessories that can add to that space! I feel like statement mirrors can really enlarge an area not to mention the light they bring into a room and I am swooning over some of the mirrors One Kings Lane has to offer! I am really not a fan of getting ready in the bathroom nor am I a fan of being rushed while preparing myself for the day so when I thought about reflecting my personality through a vanity I know that comfort and convenience is a necessity! By adding in a few additional pieces that provide storage I could easily coverup the fact that my desk oftentimes acts as my vanity and you will never hear me complain about a few extra compartments for this and that! Also, One Kings Lane is having an awesome fourth of July sale that has me lusting over loads of pieces! Pretty pieces! 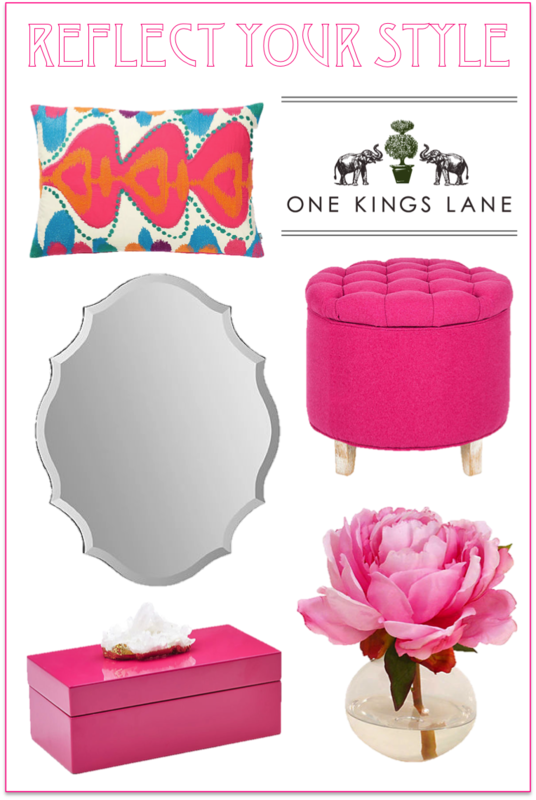 Love that little pink quilted stool thing! I'm moving in two weeks and looking for some great apt finds, thanks for sharing lovebug!